Mention the Touraine, and the uninitiated will reply, "Where?" If you are one of those who have not yet become acquainted with this lovely region of France, it may be worth spending a little of your time addressing the gaps in your knowledge... especially if you are considering purchasing a property in France in the near future. It could also be that you actually know the region better than you think, and that you have simply known it by another name, for the Touraine is its old name, the name given to the old province whose capital was the great city of Tours in central France. The Touraine is also commonly referred to as "The Garden of France". Where is the Touraine, exactly? Situated somewhat south and south-west of Paris (Paris Property Guide), the Touraine is the land that lies right in the very heart of France, where the River Loire crosses the region known now as the Centre Val de Loire (The Central Loire Valley Property Guide), and where the tributaries of this great river, the Indre, the Cher and the Vienne, also bring a lushness and fertility to the land. What is the Touraine famous for? Who will buy property in the Touraine - who will it most suit? There are, of course, many diverse aspects to the Touraine. It is perfectly possible to find a property in a quiet corner where a simple rural lifestyle beats as ever to the rhythm of the land and the seasons, unchanged by the demands of modern life or the requirements of a sophisticated society. The Touraine, though, in general, is best suited to those would be British ex-pats who love the finer things in life, and who should find their aspirations a perfect match for the Touraine and all it has to offer. The ancient capital of the province, Tours (Tours Property Guide) is a city of great elegance, with a reputation as an intellectual stronghold. There is history and sophistication by the boatload here, but also a young and vibrant student population who keep the city from becoming stuffy and caught in its own constraints. Certainly lovers of art, architecture, history and culture of all sorts will find enough to keep them in Tours for a long time. The Loire valley, revered as one of France's best loved and most desirable regions, is also a haven for lovers of nature. The lushness of the river valley provides a perfect environment for some rare and delightful flora and fauna, and nature walks along the river banks are sure to be a never ending source of interest and pleasure (Finding property in the best walking areas of France). Not for nothing is the Touraine known as "The Garden of France". The Touraine is a wonderful region with a rich historical heritage. The evidence is everywhere, but perhaps most famously evident in the proliferation of fabulous chateaux that seem to be simply everywhere in the region. There are chateaux that are open to the public, so that you can get a glimpse of what life was really like for the rich and privileged... and perhaps a glimpse of how the lifestyle of today can be lived within the walls of a great castle as well. Sportsmen are not forgotten here either (Sport in France). 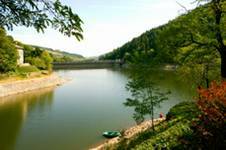 You can find excellent fishing (French Properties with Lakes), golf courses (Property Near Golf Courses in France), horse-riding, tennis and many other sports and sporting facilities in the Touraine. Are Brits welcome in the Touraine? Are the British welcome in the Touraine, and are there many settlers here already? Yes, yes, and YES. Ok, I know there wasn't a third question, but the emphatic yes signifies that this is a region that has already proved itself of great interest to British property buyers (Brits in France). You may wonder, if this is the case, why you haven't heard more about it, as it rarely features on buying property abroad programmes and suchlike. The answer is simply that the people who discover the delights of this region are not the sort of people who want to shout about it. Quietly elegant, like the area, they prefer to keep it to themselves and thus to preserve the very qualities that drew them to the Touraine in the first place. So you will find other British people here, certainly, who are welcoming and friendly (as are the French), but it's not the place to be if you fancy setting up a chain of fish and chip shops, British style pubs and Bingo halls. Incidentally, Mick Jagger has had a home in the Touraine for many years and it is said that he is a regular figure in the bars and restaurants of Tours. What sort of property is available in the Touraine? The property available in the Touraine is one of the region's principal glories. 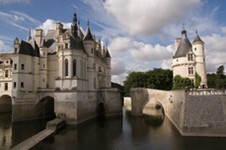 If you have ever dreamed of owning a great French chateau then this could be your lucky region. Seriously, there are plenty of grand chateaux and manor houses on the market in the Touraine, but don't expect to pick them up for a song. The area is all too close to Paris for that, and too elegant and sought after too, although a canny soul may find cheaper large properties around if they keep their eyes on the market. Those with money to burn should concentrate their searches around the Loire valley where there are some wonderful properties in the higher price bracket (at the time of writing there is a chateau property (complete with pink brick, blue slate roofs and fairytale turrets) for sale with 35 hectares of land, a turreted gatehouse and a guarantee of all your dreams coming true. OK, the last statement may be a slight exaggeration, but as long as you have €1,600,000 to spend, then I think you would be very happy there! Cheaper property (Cheap French Property), including farmsteads to renovate (House Renovations in France) and village houses, may be found in the Cher department (Cher Property Guide) to the east of the region, and in the south of the Indre (Indre Property Guide).